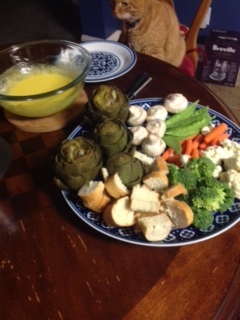 I have been really excited to try out Julia Child’s recipe for artichokes and hollandaise sauce. I have never made hollandaise sauce from scratch before, I had only ever used a packet from the store. I will never every buy a packet that says it makes hollandaise sauce. Making from scratch is the way to go and it is ever so tasty. Really I have no idea what I was thinking when I used that packet, why had I not tried to make it, truthfully I think I was afraid I would mess it up and that I thought it would take forever to make. Reality it was quick and simple. Artichokes were only ever purchased in jars for salads. I really wanted to try making them. So they too were a purchase from Trader Joe’s, a nice 4 pack and looked really lovely. Boiled them like Julia suggested and they turned out great with one exception. The artichokes I picked were not very big so there was not very meaty. So next time bigger artichokes and not the baby ones. Which is good so now I learned this wonderful lesson of not to be afraid to try something new in the kitchen even. 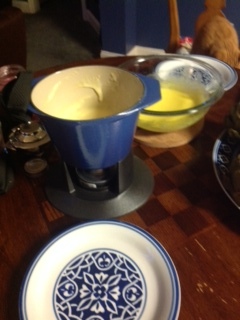 I also made Swiss fondue to accompany our artichokes. I love fondue, you might say I am an addict. While I know it’s not something I can have every week, I do so look forward to making it. In my pictures you can see my latest fondue pot from Le Creuset. Currently I have five different fondue pots that I have acquired over the years. Which I love pulling out at holiday parties and special occasions. It is also one of my Mom’s favorite things to have when she visits. Friends and neighbors say they enjoy coming over for enjoy it at the parties as well. I think the draw is that it’s fun and unusual.